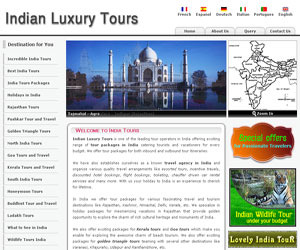 Indian Luxury Tours is one of the leading tour operators in India offering exciting range of tour packages in India catering tourists and vacationers for every budget. We offer tour packages for both inbound and outbound tour itineraries. We have also establishes ourselves as a known travel agency in India and organize various quality travel arrangements like escorted tours, incentive travels, discounted hotel bookings, flight bookings, ticketing, chauffer driven car rental services and many more. With us your holiday to India is an experience to cherish for lifetime. In India we offer tour packages for various fascinating travel and tourism destinations like Rajasthan, Kashmir, Himachal, Delhi, Kerala, etc. We specialize in holiday packages for mesmerizing vacations in Rajasthan that provide golden opportunity to explore the charm of rich cultural heritage and monuments of India. We also offer exciting packages for Kerala tours and Goa tours which make you enable for exploring the awesome charm of beach tourism. We also offer exciting packages for golden triangle tours teaming with several other destinations like Varanasi, Khajuraho, Udaipur and Ranthambhore, etc.